As the follow up to the excellent first film in the franchise, “Dawn of the Planet of the Apes” was a decent attempt at explaining how a group of apes could come to blows with a struggling human population. Prior to watching this movie I was intrigued as to why the apes would go to war with the humans given that Caesar (Andy Serkis) is portrayed as a reasonable leader, and I was pleasantly surprised by how the writers dealt with that problem. Caesar’s character remained true to what the first film established and it was clear that he really didn’t want to fight; he only wanted what was best for his own kind. However, his attempts to keep the peace always felt futile, which gave a believability to events because as we all know the world doesn’t always work how you would like it to. Nevertheless, this is far from a perfect movie and it didn’t live up to my expectations given the hype that built around it after its release. Whether or not you can enjoy “Dawn” depends partly on how you take to a story about intelligent apes challenging humans for dominance. Many people struggle to buy into that and I can understand why, but personally I think that the special effects are good enough in this movie to allow for a suspension of disbelief. The film revolves around Malcolm (Jason Clarke) and a group of human survivors who are trying to create a life for themselves. The Simian flu (ALZ-113 virus) has killed much of the population, so the story is as much about survival as it is about avoiding conflict with Caesar and the rest of the super-intelligent apes. As the film begins we’re taken into the heart of Caesar’s home and we see the apes hunt for food, gaining insight on how they are able to live apart from the humans. I felt that this was a smart way to open the film because it allowed the audience to get to grips with how an ape society would work, and by making the apes the focal point of the movie it was easier to create tension between them and the humans because the latter were intruders on another species’ land. However, one of the best scenes of the trailer and the subject of many posters promoting the film took place right at the start of the movie, which from my perspective was very disappointing. The apes were wearing war paint and on the trailer it seemed as though they were preparing for some kind of epic battle with the humans, but in reality they were simply hunting for food. It was a shame that this imagery was wasted on such a small section of the movie because it had the potential to be an iconic moment, not only in this instalment but in the series as a whole, and its inclusion in the trailer was extremely manipulative. Towards the start of the movie the apes don’t really talk to each other and we never actually learn whether or not they are all able to speak. Most of the time they communicate using sign language, which is cool in concept, but was poorly implemented. There were periods of the film in which I had to spend a lot of time reading subtitles, which is fine, but this meant that I couldn’t always watch what the apes were doing and thus I missed important moments. Not only were the subtitles distracting, they were also ridiculously worded because the apes would make small movements which were inexplicably accompanied by two or three lines of complex dialogue. The movements the apes were making couldn’t possibly be the equivalent of that much specific information so it was clear that what was being conveyed didn’t match what we were seeing. This is only a small issue but it was one that frustrated me, and it was the main reason why I felt that the first few scenes were the weakest of the movie. Nevertheless, the special effects in “Dawn” are truly breath-taking and they make up for most of the movie’s flaws. Never before has computer animation brought a creature to life in the way that this film does. Andy Serkis is brilliant, particularly considering how difficult it is to play someone with a different personality never mind an animal! You can really sympathise with Caesar’s situation; he faced a struggle for leadership whilst hoping to maintain order and he also had to teach the rest of the apes how they should handle themselves with their new found independence. Caesar has learned valuable lessons from his time living with Will Rodman (James Franco) and has a more sophisticated understanding of the world than his adversaries; as a result he loses the trust of his allies and makes decisions which Koba (the film’s antagonist, played by Toby Kebbell) cannot understand, causing friction in the ape world. Koba was a great villain because he simply could not reconcile with the cooperation between Caesar and the humans. As Caesar himself notes Koba only learned hatred from his time with humanity and as a result that is all he wants to give back. However, I do feel that his character became slightly too evil as the film progressed and therefore lost some believability. All the performances in the film were good but in my opinion Gary Oldman was completely underused. As far as I’m concerned he’s one of the best actors working today, and after seeing the trailer I thought that he would have a significant role in the film, but unfortunately he was a background figure. When he was on screen he conveyed a lot of emotion, particularly when he was looking at a picture of his family, but it didn’t feel as though the director knew what to do with him. 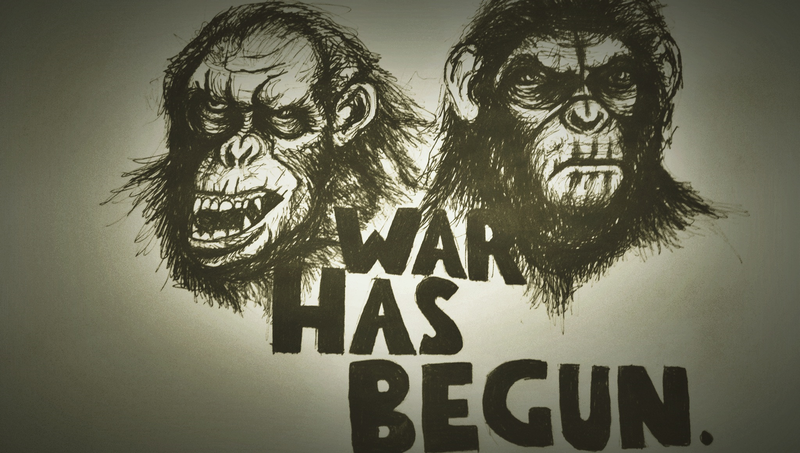 Still, “Dawn of the Planet of the Apes” is a good movie and a strong sequel. Personally I don’t think that it’s a better film than its predecessor, “Rise of the Planet of the Apes”, but I enjoyed it for what it was. It’s a movie filled with emotion, tension and good performances, but it doesn’t deliver in terms of action and it’s more predictable than a film with this much ambition should be. It’s a good set-up for the next instalment and there’s a lot to like about it, but I feel as though it will be remembered as a pioneer for computer-generated imagery rather than as the defining film in the series.